If you're looking for a book to help cope with feelings of sadness or grief, this might be a good choice. I like animal stories, and I really liked the chance to think about a situation from the perspective of an elephant. A poignant middle grade animal story from talented author Linda Oatman High that will appeal to fans of Katherine Applegate’s The One and Only Ivan. 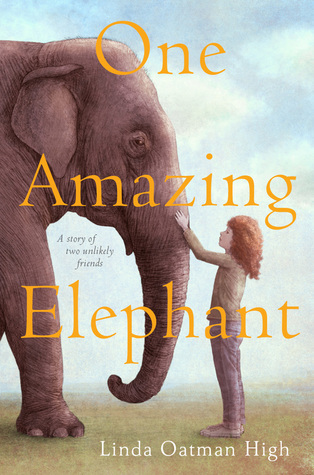 In this heartwarming novel, a girl and an elephant face the same devastating loss—and slowly realize that they share the same powerful love. Twelve-year-old Lily Pruitt loves her grandparents, but she doesn’t love the circus—and the circus is their life. She’s perfectly happy to stay with her father, away from her neglectful mother and her grandfather’s beloved elephant, Queenie Grace. Then Grandpa Bill dies, and both Lily and Queenie Grace are devastated. When Lily travels to Florida for the funeral, she keeps her distance from the elephant. But the two are mourning the same man—and form a bond born of loss. And when Queenie Grace faces danger, Lily must come up with a plan to help save her friend. One Amazing Elephant was written by Linda Oatman High and published by HarperCollins in 2017. It’s a touching, emotional story of a girl making friends with an elephant and learning to love each other in the face of their fears and sadness. I didn’t expect part of the story to be told from the elephant’s perspective, and it took me a little while to get used to it, but I thought it was an interesting way to tell the story. I feel so sad for Lily, having to cope with her grandfather’s death as well as the way her mother treated her. Along with Queenie Grace, I really liked Lily’s new friend Henry Jack, who stuck by her side when she needed someone. This is an interesting book to study if you’re considering writing from the perspective of an animal. The story is told using a first person point of view in present tense, which brings a feeling of immediacy to the story events. I admired the way the author created so much emotion though the rhythm of the language. There are possibilities for class discussions about animal cruelty, animal emotions and how humans care for animals would capture student interest. This book might pair nicely with The One and Only Ivan by Katherine Applegate, another story written from an animal perspective. I don't really like books from an animal's perspective, but this sounds good. I especially like the dealing with grief theme since it's been a big part of my life these last years. Normally, I'm not a huge fan of animal stories, but I absolutely adored THE ONE AND ONLY IVAN, which was entirely told from Ivan's point of view (and it didn't bother me - I loved the prose poetry). Still, I can see why it took you a while to get used to the switch from Lily's POV to Queenie Grace's. Sounds fascinating, though. Especially since there's been a lot in the news recently about Ringling Brothers/Barnum & Bailey closing, and about cruelty to circus animals. This sounds like an outstanding read. I love elephants and like that this is told from the elephant's viewpoint. Will look for this book! Thanks. I am reviewing a PB k on Friday about a kids who rescues elephants in Thailand. Elephants are my favorite animals. I haven't heard of this book, but your great review makes me want to add it to my ever-growing TBR pile. The cover is gorgeous, and though I don't normally like animal stories, the premise of a girl and an elephant being friends really drew me in. I'd be interested to see how the dual POV is handled--it sounds unique!